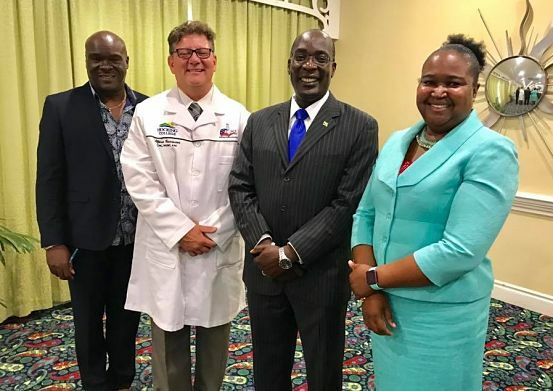 FANTASTIC FOUR: Education minister Senator Ruel Reid (2nd right), Dr. Grace McLean (Chief Education Officer), Dr. Cecil Cornwalll (JCTE), and Hocking College's Alfonso Contrisciani at Tuesday's awards ceremony; (below) participating teachers enjoying the sweet rewards. THIS past summer, 27 Jamaican teachers travelled to Nelsonville, Ohio, to participate in a two-and-a-half week-long training programme in the culinary arts, at Hocking College, under the tutelage of celebrated certified master chef Alfonso Contrisciani. 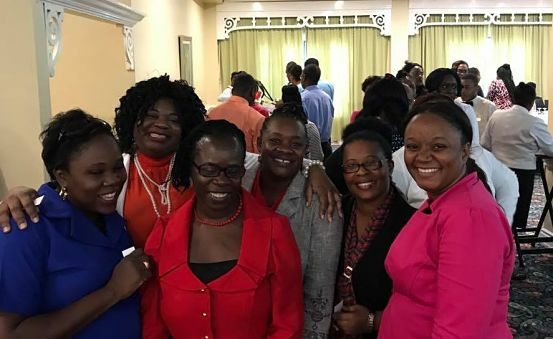 At the end of their training (July 5-23), the teachers, who hail from several parishes across the island, returned home with certification (and new skills) worth adding to their résumés. In fact, on Tuesday morning the cohort got to reunite with Contrisciani, as a formal awards ceremony (where the certificates were handed out) was held at the Knutsford Court Hotel in New Kingston, put on by the Ministry of Education, the HEART Trust/NTA and the Joint Committee for Tertiary Education (JCTE), who jointly spearheaded the programme. For Opal Reid, the time spent at Hocking College was a life-changing experience she’ll always cherish. “It was wonderful; we all had a great time. We got upskilled. We got a chance to broaden our teaching experience, and now we are able to go into an area in which we never had experience before,” the Marcus Garvey Technical educator tells TALLAWAH. She teaches French and Spanish and is a guest tutor in Home Economics. “All of us who attended are now food supply managers,” she notes. But, specifically, they attended classes on food preparation and demonstration, event planning and management and leadership. Over 300 educators in total took part in the Ministry of Education-funded summer programme. While some went to Hocking College, one group flew to Canada’s Liaison College, while a batch remained in Jamaica for classes with American instructor ‘Prof’ Josh. In short, the teachers slipped into the role of students again for instruction in a range of disciplines spanning construction, auto mechanics, tour guide services, allied health care and health care assistance, culinary arts and international baking and pastry arts. “We all had an excellent time. It was a great learning and cultural experience for all of us. We were sharing modern techniques and different methods of cooking,” offers Contrisciani, Hocking College’s Academic Dean of Hospitality, who has been in the island before to lend his expertise to A Taste of Jamaica as an international judge.